To stay true to my word, i will continue with facebook video downloader websites. 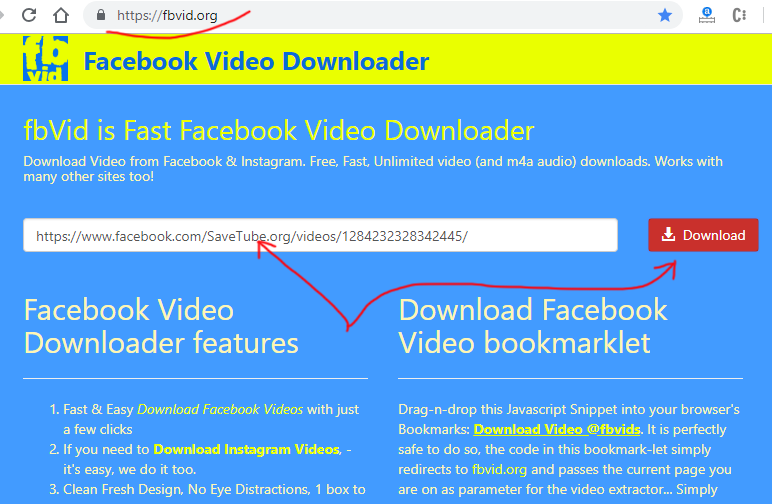 This time we are dealing with site called FBVID.ORG, it’s a nice unknown yet little site with the ability to download videos from facebook. Since site isn’t yet scratching any good traffic, i may end up having this article shorter than usual..
my memory may be wrong, but i think there was a site with this name before, maybe fbvid.com, maybe it was fbvid.org we see currently, but as far as i remember, old version site was bullied into shutting down with constant DDOS attacks and general bad word of mouth.. Well, after 2-3 years it seems someone else snatched the nice domain and tried it again. Lets see.. The site is 9 months old, it seems that absence of crowds of visitors is keeping this site at the state of “wanna get traffic”, hence there are no ads, no popups, nothing really. Just 1 simple white box in the middle of blue background. Put your video link in the box, press big red download button, and next screen opens up the video (represented by its thumbnail, despite “global trends” of showing video itself) download options. Download happens fast from facebook servers, site has quick info on how to use it, generally – nice impression. But let’s see how it works in the following guide on how to use it. Facebook sites are different from youtube downloader sites, they do not allow any search. Making them even easier to manage.. But yes, usually facebook videos are not indexed that much, it’s hard to search for fb video in the world of youtube and google.. So here we are.. First step of this tutorial is again a way to find and copy facebook video link into clipboard. 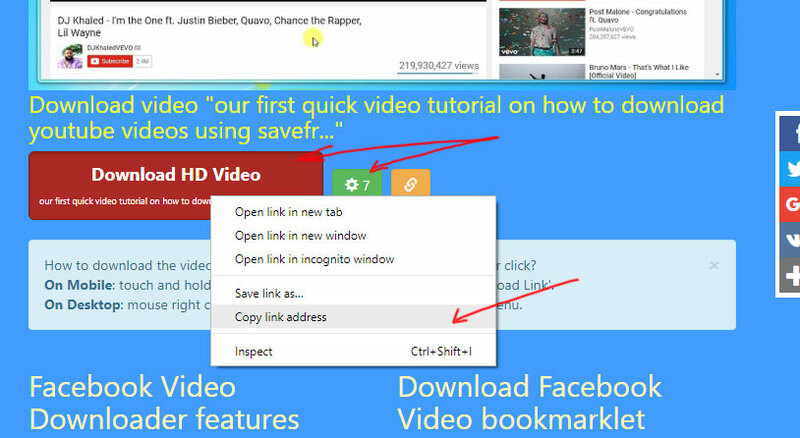 Here you can see we will either copy video link from browser address bar (click in it, then Right Click, pick Select All from menu, then Right Click, pick Copy from menu) or we can go the easier way and Right Click on the video, then pick Copy video URL at current time option. This action will place the video link into clipboard. Later when we need it, – we use it, extract it from the clipboard. Mobile instructions are the same, just replace “Right Click” with “Touch and Hold”..
As I’ve mentioned above in the review section, this site offers multiple download options for facebook videos. First we see the video thumbnail, indicating the right video is being processed. Below there’s a big Download HD Video red button, hard to miss. Right click on it, from the menu select “Save Link as” option. Mobile – touch and hold, select Download Link option. 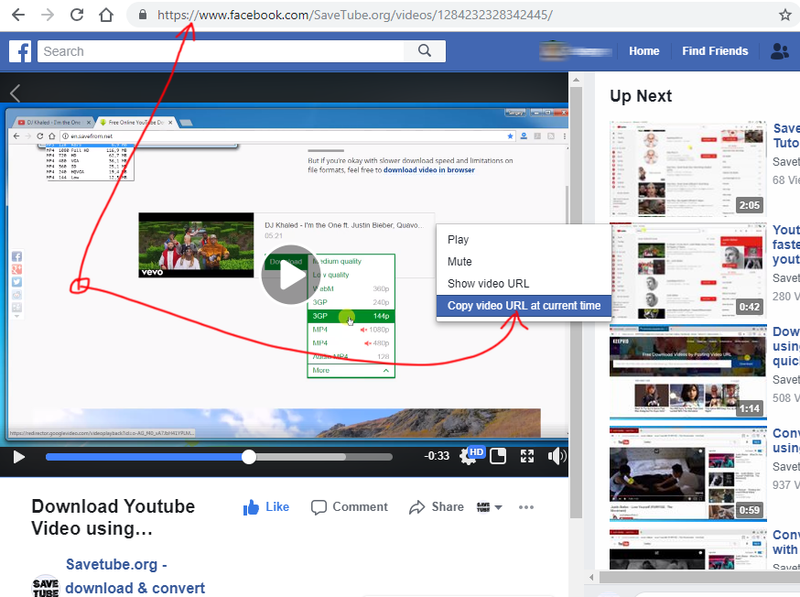 Here we just see the illustration on how to download facebook video from fbvid.org. You can either go for the red button, or use any of the 7 possible other formats. This image is kinda wrong, it points to the Copy Link Address option in the context menu, just go for the one above – Save Link As. This is actually a good error, it indicates the option to pick when copying video link into clipboard. If you click the green-white cog icon with 7 next to it, you will see more download options. Please, check it out below. 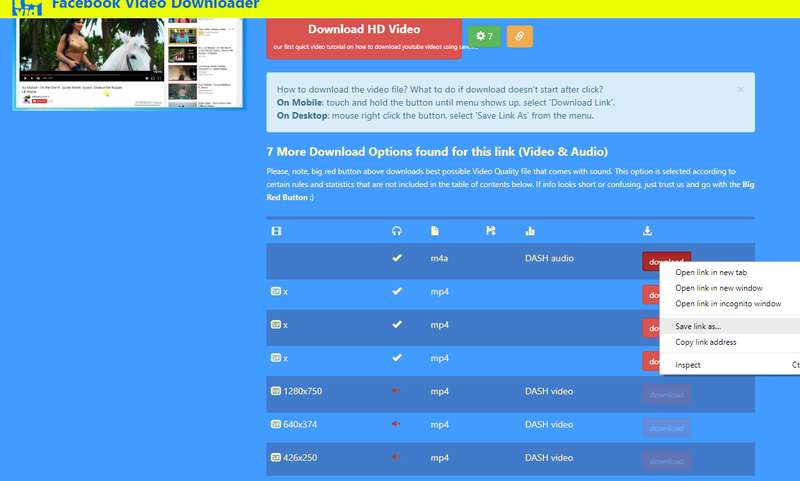 Now you can see 3 video options, 1 audio download option, and 3 more video without audio options. Audioless video is stored this way because audio is same for all 3 video formats, so no need to store it in each of the video files, they just put it separately, and browser plays both video and audio files simultaneously, making it look all good nsync. As usual, here’s the proof of my download. I didn’t change filename on save, but you could, enter new filename right away and get rid of all those digits in the filename.. It’s a thing, some sites work around it, like this soundcloud downloader offers filename properly formatted via the title. Or this youtube mp3 converter gives you the file named the right way from the start. But smaller sites like this reddit video downloader or twitter video downloader, they are small, they cannot afford the way when filename can be changed.. There are tons of sites to download online video. Some of them work with a myriad of websites, doing both the work of proper instagram video downloader, vimeo downloader or maybe even helps you download music from youtube all together. But those sites are usually limited to the global-score procedures, those that work on one site might break on the other. So we have specialized sites like fbvid.org that work with 1 site but do the job right and download video for you in a snap. This is one of those sites, only works with facebook, says it can also process instagram, does it well for fb, insta some videos do not work, but for the task at hand – the facebook downloader – it works very well. Site has zero distractions, no ads, no popups, no browser notifications that’s been so popular lately.. Very good site. Proper facebook video downloader. Recommended by savetube!